We always recommend to our customers to consider buying a bigger safe than they intend, and we base this advise on years of feedback received from some of our many past clients who, at the time, had similar safe requirements as yours. We hear the same old complaint “I should have listened to your advice and purchased a larger safe at the time. 5 years ago we had enough room but our safe is far to small now”. 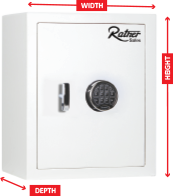 Remember most people will usually have a safe for many years so you need to consider what you will store in it now and also make allowance for the fact that you will acquire more valuables in the future, so don’t choose a safe that will end up too small because sooner or later you’ll appreciate the extra room. 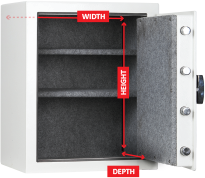 It is very important when selecting the size of your safe to keep in mind that the majority of safes internal dimensions will be different to the external dimensions, being the inside size will often be smaller and this can differ considerable between different manufacturers and brands. Never try to gauge the safes inside size from the outside front only.